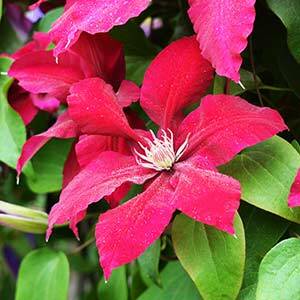 Clematis plants including both species and hybrid clematis varieties are a widely used as climbing plants in cottage gardens. We have been growing them for over 20 years with very few problems. Bursting into flower in mid spring the large flowering hybrids provide a riot of color as they wind their way through trellis and nearby plants. We use a seaweed based fertilizer in spring and again in early summer and find this adequate, depending on soil a slow release fertilizer can also be beneficial. With over 100 hybrids available from online and mail order nurseries and growers, including evergreen, rare and fern leaved varieties, if you can plant these wonderful flowering plants with the roots in the shade and give the plant something to climb on, you can soon have a spectacular display. Modern cultivars have fantastic flowers and come in a fantastic range colours. 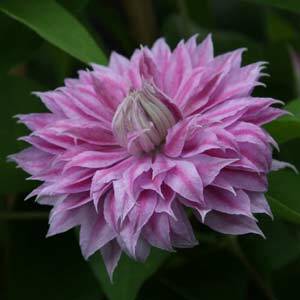 Clematis care is fairly simple if you take into consideration that they prefer to have a cool root run, so if you can find a position where the roots will be in the shade and the plant itself receives morning sun your clematis will love it. In general they are a vigorous deciduous or evergreen climber depending on species and like many plants prefer a well drained soil but humus rich moist soil, mulch the root run to keep it cool and moist. Every year breeders release new varieties,their is certainly no shortage of colours. Flower forms vary from single to doubles with many large flowering types on the market. ‘Josephine’ (picture right) is an interesting cultivar with fantastically complicated flowers, a real show stopper, the ‘Queen of clematis’. C. serratifolia ‘kugotia’ “Golden Tiara” is a fast growing, late-flowering variety reaching to 4-5m with intense golden-yellow, bell-shaped flowers and dark stamens. Best cut back to 1-2m each year in late winter to early spring. C. microphylla or ‘Small – leaved Clematis’ and C. aristata are two of the best known species of Native Australian Varieties. Australia's largest producer of hybrid clematis including new releases. 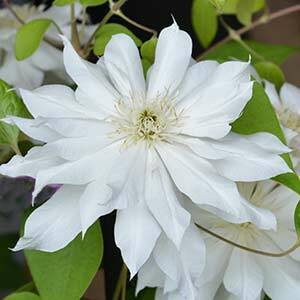 Known for quality clematis plants. Mail Order available. Mail order and wholesale available.